"Beef strips are stir-fried with onion and peppers in this quick stove-top meal. Serve with your favorite rice or noodles." Cut steak across grain into thin strips, then into 1-inch squares; coat with 1 Tbsp. hoisin sauce. Heat 1 Tbsp. oil in hot wok or large skillet over high heat. Add beef and stir-fry about 1 minute; remove. Heat remaining 1 Tbsp. oil in same pan. Add peppers and onions; stir-fry 5 minutes. Stir in beef and remaining 1/4 cup hoisin sauce; cook and stir just until beef and vegetables are coated with sauce. Serve immediately. Make a beef and vegetable stir-fry with a sweet and savory ginger-soy sauce. Very good, I added a can of drained pineapple chuncks & some black pepper. Next time, mushrooms are going to added as well. 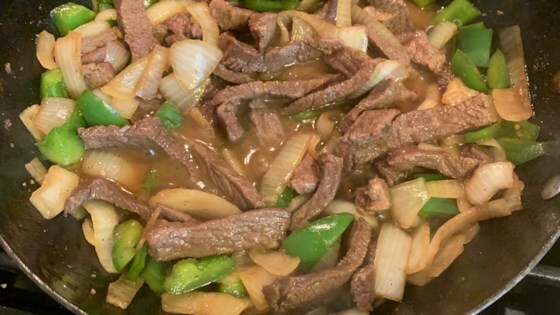 Never liked Pepper Steak before this recipe! The whole family really loved it and we will make this often. Very quick and easy meal to prepare. My husband kept telling me over and over how much he liked it. We'll be eating this often.